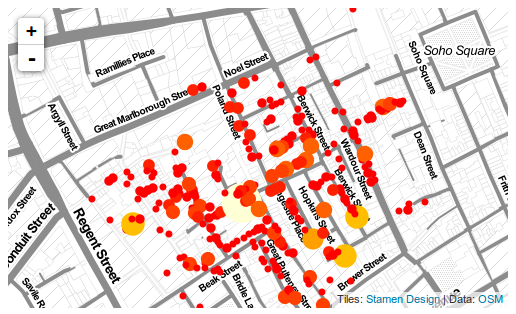 A set of functions to quickly and easily create interactive maps based on Leaflet. Designed to work with mapData via sp objects. Also implements some functions to convert more complex objects (like contourlines, graphs, ...) into sp object. To install the package you can use devtools. You also need to install rleafmap. 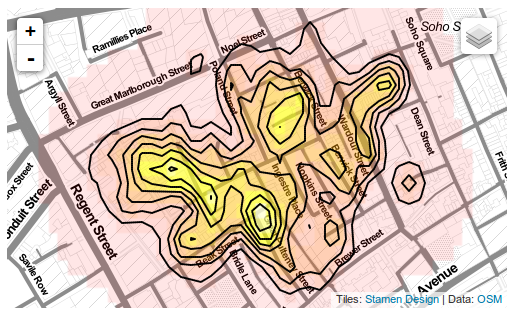 First, load the package and the cholera dataset. The package provides a collection of simple *Map functions to easily get interactive maps. You can use quickMap to quickly represent points and polygons and set colors and sizes using a column of the dataframe linked to the sp object. You can use the heatMap function to get an heat map (raster image and/or contour lines) from a SpatialGridDataFrame. 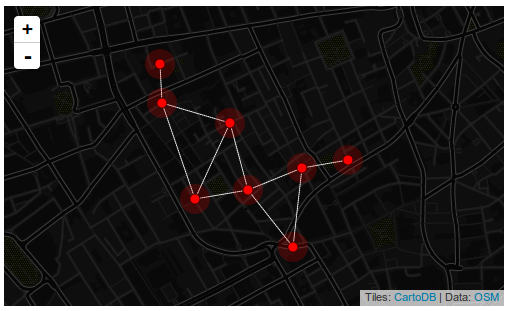 You can use netMap to map spatial networks from an igraph object. For example we can create a network of pumps in Snow's London by connecting pumps which are geographically close. Note that you need to set explicitly geographical coordinates to the graph vertices with the lat and lon attributes.